By now you’ve probably read about the school district in Texas that wants to spend some large sum of money to outfit its high school students with RFID chips in their identification cards. RFID stands for radio frequency identification. Yes, indeed. You can now track students wherever they go. 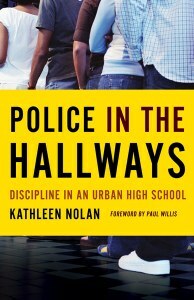 It’s not enough to have metal detectors, hall passes, detention areas, lunchroom and hallway monitors, bells to mark periods of the day, rule books you can sit on, zero-tolerance policies, rewards and sanctions for good and bad behavior, report cards, closed campuses, a panoply of punishments for sundry infractions, and quasi-judicial disciplinary procedures. Now we have radio-frequency identification cards that you are supposed to wear around your neck. Are the students institutionalized or what? Here’s the big question no one wants to think about that much. Students who receive this institutional treatment spend their entire adolescence and then some in schools that train them to be passive and compliant. They are supposed to be ready for adulthood when they leave those schools. Whether they depart for college, a job, or some other destination after commencement, many eighteen year olds leave home highly familiar with a remarkably controlled environment. If we want them to be compliant citizens – in fact, so compliant we could hardly call them citizens – what would we do? We would create high schools like the ones we have now. A lot of high school students would not even question the emphasis on obedience, monitoring, and control in their high schools. It’s all they know. From age eleven or so – when they enter middle school – through their high school years, the institutionalization becomes habitual, part of the daily routine. The only substantial difference between high school and middle school is that high school is bigger. Another scary thing is that a lot of parents seem to like schools that operate like quasi-prisons. They like the lockdowns, police officers in the hallways, the locked doors and the check-in procedures. All these measures seem to keep the students safe. Parents like that. Keep people scared, and you can do anything to them. Keep them on edge, and they’ll accept anything. When you create a secure environment, you create an environment that is easy to control. When you create a controlled environment, you can give people the illusion of safety. Meantime, the balance of authority tips strongly toward rule-based behavior and away from unpredictable, freer modes of action. If you wonder why adolescents seem to be under so much stress, look at the unnatural environment they encounter every day. It ain’t Summerhill. It’s not a place where they can grow towards freedom, or find their place in the world. Back when John Dewey argued for education reform, he noted how much our secondary schools resembled factories. The architecture resembled the multi-floor, brick sweatshops of the industrial revolution. More significantly, they had bells, just like our factories use to mark the beginning and end of a shift – factories graduates find themselves in after they earn a diploma. That’s effective acclimation for our youth, fellow citizens. John Dewey said that if we want educational institutions, let’s design them as schools, not factories. The idea of a campus developed: a place where people could think, learn, and grow. Few would call today’s secondary schools campuses. They acclimate youth to life in a nationial security state: a place where security and safety trump everything else, including freedom. It is a place that cultivates qualities they’ll need in a country that has campaigns like, “See something, say something.” We used to honor freedom and wide participation in public affairs. Now the state wants us to turn our neighbors in if we think they act suspiciously. It encourages compliance, passivity, and silence. Speak up only if you want to report something suspicious. Ask the survivors of Waco how well the state tolerates people it perceives as a threat. Ask the people who joined the Occupy movement. If you voice your discontent – if you join with others to express your unhappiness pointedly but peacefully – you’ll feel a police baton come down hard on your back. If you didn’t learn to be quiet and orderly in high school, well, we’ll teach you now. Here’s a memorable footnote to the report from Texas about the new student ID cards. One female student declined to wear the card, saying this kind of technology is too intrusive. The school responded that if she did not wear the card, she could not vote for prom queen. The school rescinded other student privileges as well. The point is well taken and the factory analogy is apt. However, the RFID tags can only be read from 6 inches or so and are completely useless off campus. These were put in place to secure an accurate attendance count since federal funds flow based on this metric alone. Beyond this, the innovative economy of the future will not be rendered most successfully in the ‘lock down’ high school so described. RFID tags are also dehumanizing and I am certain have become a part of student culture in insidious ways from an organizational behavior perspective. Nothing good will come of this – yet another unintended consequence of government involvement with education. The private sector would never consider RFID tags because parents would find them distasteful and institutions that implemented them would become less competitive.